1. Preheat the oven to 200°C, gas mark 6. Snip two of the rashers of bacon into small pieces. Heat half the butter in a small frying pan and cook the shallots and snipped bacon together for 3-5 minutes until softened. Stir in the oatmeal and toast over a medium heat for 1–2 minutes. Add the five spice, breadcrumbs, chopped apple and seasoning, and bind with the egg. 3. Add the white wine to the roasting pan and scrape up any juices from the base. Boil until reduced, then stir in the flour and cook for a minute. Add the stock and bring to the boil stirring. Simmer for 1–2 minutes then season to taste before straining through a sieve. 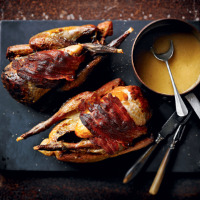 Serve with the guinea fowl.